These true and dramatic stories of two nineteenth-century Brazilian women; one young and born a slave, the other old and from an illustrious planter family; show how each in her own way sought to exercise control over her life. The slave woman struggled to avoid an unwanted husband and the woman of privilege assumed a patriarch's role to endow a family of her former slaves with the means for a free life. 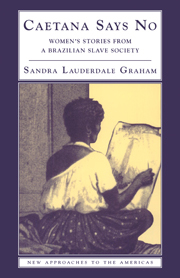 Sandra Lauderdale Graham casts new light on larger meanings of slave and free, female and male, through these compact histories. Part I. The First Story: Caetana Says No: Patriarchy Confounded; Part II. The Second Story: Inacia Wills her Way: Patriarchy Confirmed.